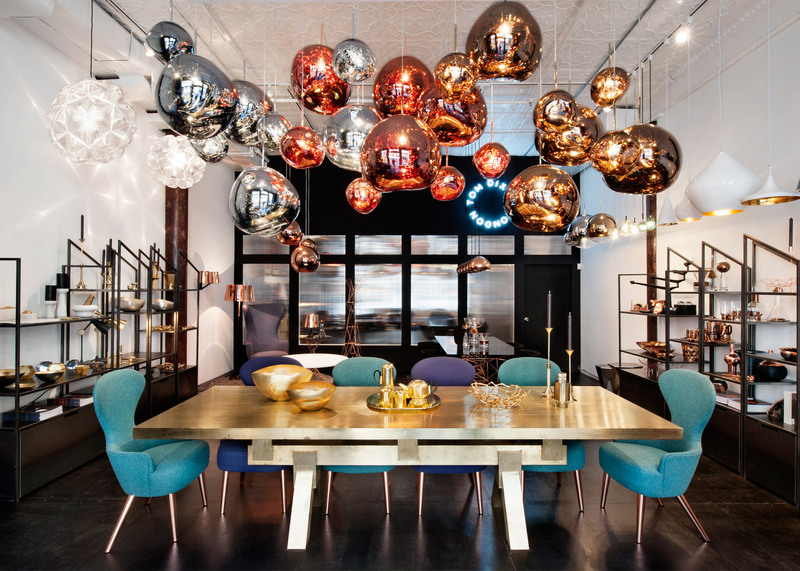 British designer Tom Dixon has opened a permanent store in New York's Soho neighbourhood, saying America has become "a land of opportunity" for his brand. The Shop, which opened 3 November at 243 Centre Street, encompasses 1,000 square feet (93 square metres) and is located at street level, just a few blocks from showrooms for Luceplan, Foscarini, Ingo Maurer and other leading design brands. The designer has run a New York office for five years, but this marks his first retail space in the city. "America has truly been the land of opportunity for us over the last couple of years, so we wanted to have a direct connection with the people who enjoy our work," explained Dixon. Dixon described his store as "a service centre for professionals and consumers, where the complete catalogue of 'extraordinary products for everyday use' can be shown, explained, demonstrated and of course, purchased." The showroom carries Dixon's full collection, including classics such as the Copper shade and Mirror Ball light, along with more recent additions like the Wingback range, Melt pendants and Brew coffee set. "I don't see a big distinction between our clientele on the three continents where we operate," Dixon told Dezeen. "We are producing things that seem to appeal equally in Europe, Asia and the Americas." The store also offers interior design consultation for residential and commercial projects. "It was important to have a space at street level with an open door where everybody can come in and see our fresh ideas at first hand," he added. "I hope this will be the departure point of many great adventures in the New World." The American market for high-end design is "growing incredibly" according to European brands, who are opening showrooms and restructuring their US businesses to take advantage of booming sales. Dutch furniture company Moooi opened a Manhattan showroom this year, as did the Spanish tile company Porcelanosa. The surge of luxury residential developments in New York and Miami – many of them designed by big-name European architects – is helping drive the boom, with brands following architects such as Herzog & de Meuron, Foster + Partners, BIG and OMA across the Atlantic. Dixon's Manhattan showroom is adjacent to the contemporary artist Tom Sachs' studio and the two have been friends for decades. Sachs rose to fame with his series of utilitarian objects, such as toilets and chainsaws, that he emblazoned with the logos of luxury labels like Prada and Chanel. The artist played a key role in helping Dixon decide where to open his New York showroom. "Sachs was instrumental in offering up the location and has contributed the hand-scrawled signage to the storefront, providing a warm New York welcome to the London upstarts," said Dixon. The store, designed by Dixon and his team, is intended to "be sympathetic to its surroundings". "We tried to keep as many original features as possible such as the tin ceiling," said a company spokesperson. "We also did things like sandblasting the steel pillars and leaving them untreated in order to expose the raw architecture of the space." The Dixon brand was established in 2002 and includes lighting, furniture and accessories. The designer said his clientele is very diverse, ranging from professional architects to design enthusiasts who "are interested in the evolution of international interior style". The designer's main showroom, The Dock, is located in west London. Dixon also has two concessions inside Harrods, the London luxury department store, and designed a sandwich cafe within Harrods that opened in 2014. There also is a Tom Dixon shop in Tokyo, but it is not owned by Dixon. Dixon's interior design work is undertaken by his Design Research Studio, which focuses on large-scaled architecture, interiors and installations. Recent projects include the fitting out of the Mondrian Hotel in London's Sea Containers Building. Photography is by Emily Andrews.